Real or Fake? 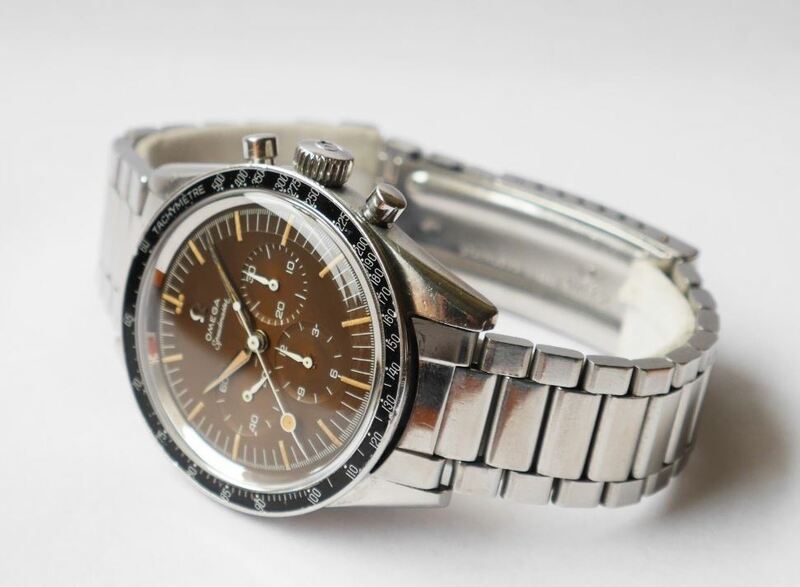 This Omega Speedmaster just sold for a whopping $52,100 on Ebay and it might not be 100% Authentic. Scary? You bet. The Speedmaster is easily Omega’s most famous line of watches, and also a favorite among collectors. First released in 1957, the Speedmaster has become a mainstay in Omega’s lineup, and its timeless design has remained largely unchanged throughout the years. And values have surged this past couple of years. 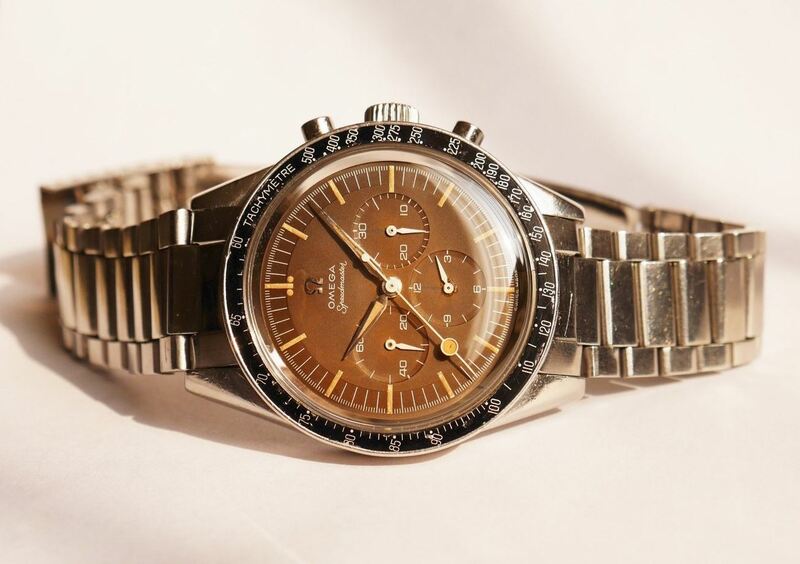 Although the Speedmaster is relatively affordable (by luxury-watch standards), vintage references can sometimes sell for tens of thousands of dollars at auction. Due to the premiums that collectors are willing to pay, it has become increasingly common to see refinished watches listed as “in original condition” on internet-based auction sites. So it caveat emptor. 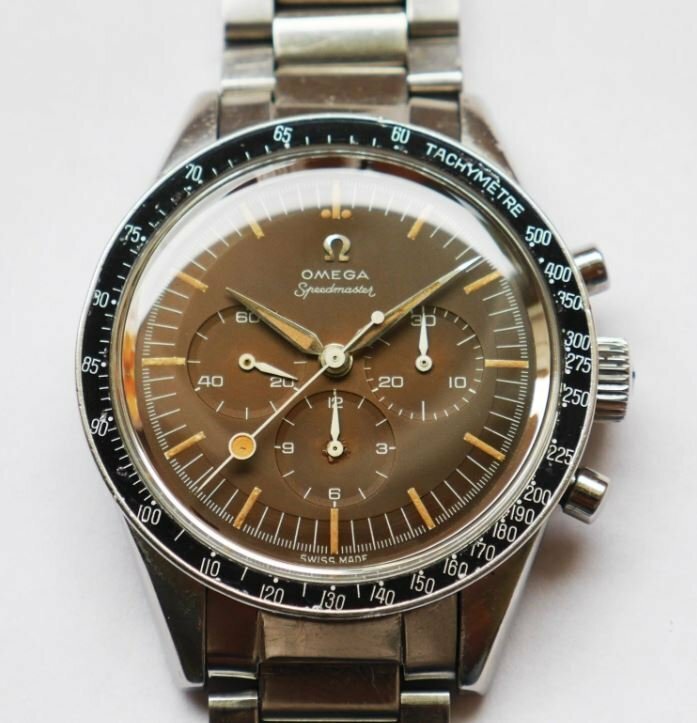 Just last week on June 19th, an Omega Speedmaster from Veracruz, Mexico sold for $52,100.00 on eBay (the seller had only 15 positive feedback). The watch was a reference 2998-2, a very early example of Speedmaster from the 1960’s that is now quite sought after by collectors. This particular watch, with its “tropical” brown dial and lollipop seconds hand, caught the attention of quite a few collectors, and its eBay listing was even featured on some of the Internet’s premier vintage/luxury watch blogs. The problem with user-to-user marketplaces such as eBay is that they are merely platforms for connecting buyers and sellers. Although eBay itself is a well-established and reputable company, often the sellers from which you ultimately purchase the items are not. Anyone can sell things on eBay, and there is no authentication process that items must go through before they can be listed for sale to the public. As a result, eBay has become a mess of questionable watches that are being sold by virtually anybody with access to a computer. 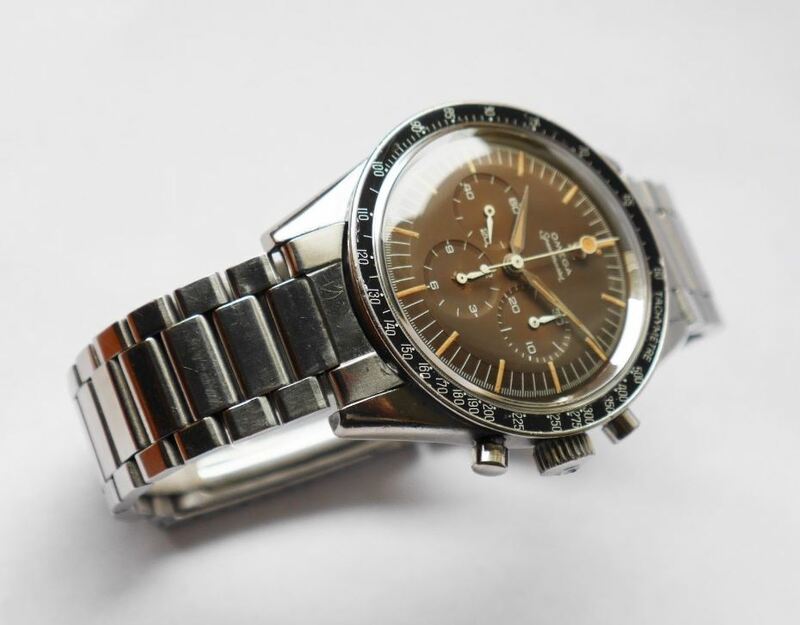 The eBay listing for this Speedmaster describes it as having all-correct, original parts; however the bezel on this particular 2998-2 has almost certainly been replaced by one from a later era; and there are also issues relating to its “tropical” dial that have caused many to question the authenticity of its coloration. There is an odd bubbling effect in the finish of the dial, most notably in the center of the sub-dial at the 6 o’clock position (see photo above). This irregularity has caused many members of the Omega Forums to speculate as to whether or not someone has tampered with the dial in an attempt to intentionally alter its color. There have been several recorded accounts of individuals using heat to try to recreate the unique colors of tropical dials. Many attempts result in dials with a bubbling effect similar to the one seen on this reference 2998-2. It is likely then, that this dial’s rich brown color is the product of an intentional effort, rather than mere luck and extended exposure to the right conditions. Additionally, this Speedmaster has a “tachymetre 500” bezel (fitted to later references), rather than the “base 1000” bezel should be found on this watch. Although the seller’s description states that it is “very possible” for the bezel to be original, its color is much too dark and well preserved to be found on a watch with a dial this faded and well-aged. 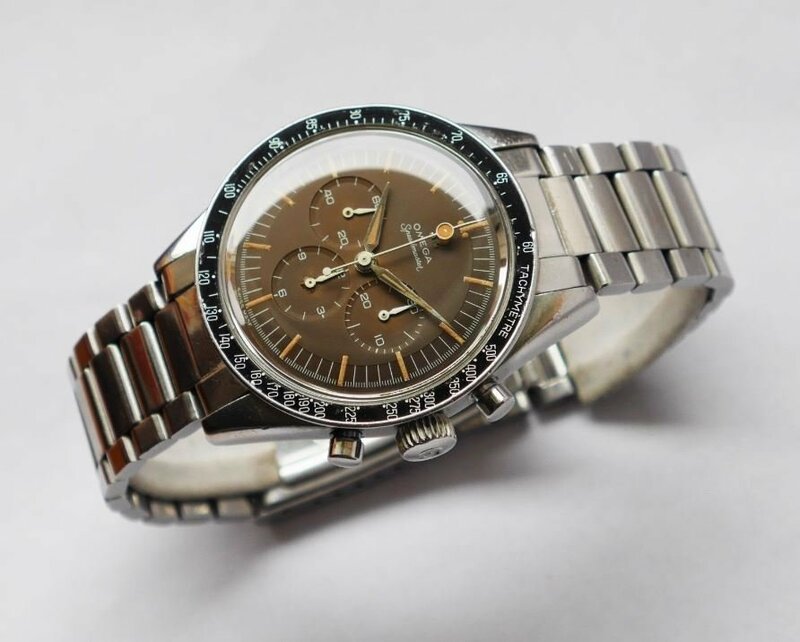 Furthermore, given how scarce era-appropriate “base 1000” bezels are for this case reference (and how much they can sell for at auction), it is more than likely that the original bezel has been replaced by one from a later reference Speedmaster. For vintage watches, the devil is in the details, and many collectors do not possess enough knowledge to accurately make informed purchases one hundred percent of the time. This Speedmaster even managed to slip past some of the leading watch blogs in the industry, whose mention of the watch certainly helped it reach its massive $52,100.00 winning bid. The core problem with eBay is the anonymity that is inherent to internet-based, user-to-user marketplaces. Anyone can sell items on eBay, and a single person can have multiple accounts making it virtually impossible to properly ascertain who exactly is selling you a watch. It is far too easy for unscrupulous sellers to obscure crucial details about their products on direct, user-to-user sites. While eBay is an available tool for buying and selling pre-owned items, its shortcomings make it nearly impossible for users to make informed purchases. Stories such as this are yet another reminder to be weary when purchasing high-end watches (like Rolex) from eBay, especially from unknown sellers.